Port of Spain (Agenzia Fides) – To ascertain the damage caused by hurricanes, comfort the victims, and organize relief: is what the Catholic communities in the Antilles are doing. "Among the recent hurricanes that continue to hit the Caribbean islands (Harvey, Jose, Irma), the worst ever has been Irma", explains to Fides Fr. J. Kaboré, Chargé d'Affaires of the Apostolic Nunciature of Port of Spain. "Hurricane Maria, which is now edging closer and closer towards Trinidad and Tobago, is more a tropical storm and it seems that at the moment it is not causing significant damage", says Fr. Kaborè. "Our Apostolic Nunciature – he tells Fides - is in constant contact with the local Churches, in particular with the Bishops of the most seriously affected islands, among these Bishop Riocreux of St Martin-St Barthélémy, Bishop S. Pinder of the Bahamas and Bishop LLanos in Antigua and Barbuda. The latter area seems to be the most seriously affected: on Tuesday, 19, Mgr. LLanos, apostolic Administrator of the diocese of Saint John's-Basseterre, called to warn us that he was visiting Tortola, Virgin Gorda, and Anguilla and it was difficult to maintain contact with those affected islands. Bishop Luigi Secco of Willemstad sent emails reporting the situation. Many Catholic groups, in particular ‘the Living Waters Community in Port of Spain’, have been particularly active in providing support to the victims". The Bishops of the region have spread various messages to express solidarity with the victims and seek help, largely from the US Bishops' Conference and have also called for a moratorium on the International Monetary Fund (IMF) with regard to foreign debt. "The islands of Tortola, Virgin Gorda, and Anguilla have suffered major damages - continues the Chargé d'Affaires - are in a very critical situation. I believe that Bishop Llanos and his people need the utmost assistance. He assured me that he would try to keep in touch with the Apostolic Nunciature, but at the moment, while he is visiting the different islands there is no connection. The Bishops continue to stay close to the people, they go to visit the families and bring comfort". 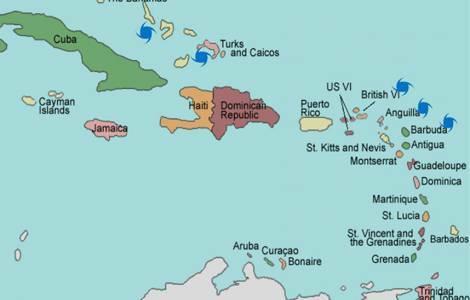 According to the Report prepared by the Caribbean Disaster Emergency Management Agency, sent to Fides by the Secretariat of the Episcopal Conference of the Antilles, "the situation is particularly complicated because the British Virgin Islands are under the British Government and, in order to be able to proceed with relief and transfer, permits are needed". "At present we all need help, especially Bishop LLanos and his people, since Barbuda has been completely swept away and the islands of Tortola, Virgin Gorda and Anguilla have reported enormous damage. I ask everyone to pray for this region", concludes Fr. Kaboré.